Description: This spacious, open-concept townhouse is a must see! 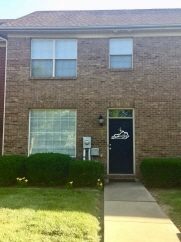 It is one of the few units in the community with a first floor main entrance complete with a guest half bath and attached 1.5 car garage, perfect for both car and storage. You'll feel right at home in this 1,240 sq ft townhouse which boasts lofty ceilings, master suite with en-suite full bath, plenty of natural light, a quaint balcony right off the dining room, and mud room/laundry room just off the garage. The home is nestled on a secluded cul-de-sac in a vibrant growing community convenient to tate's creek road, man o war, and new circle. The dove creek townhomes are in a prime location with quick access to shopping, dining, and parks. Year-round exterior maintenance, lawn care, and snow removal is included in the quarterly association dues. Data believed correct but not guaranteed. Buyer to verify data prior to offer. Agents read agent remarks.